Gibson Performance 2.5 in. 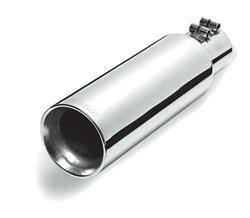 Polished Exhaust Tip 8.0 in. Long [Gibson 500421 Exhaust Tip] - $65.95 : 3rd Strike Performance, Your Source for Late Model MOPAR Performance Parts and Accessories! Gibson's gorgeous stainless steel exhaust tips are just the thing to top off that sweet new exhaust system on your ride. Made of 100 percent 304 stainless steel, these tips deliver that brilliant "show look" and will not chip, flake, or rust the way that chrome can. They feature Gibson's exclusive "clampless" design, in which the tips have a built-in clamp to speed installation and provide a very clean, custom look. Overall Length (in): 8.000 in.